What’s your goal? We can facilitate experiences that build community, highlight the importance of your mission, or both! In fall 2015, we helped Radio Milwaukee staff prepare to facilitate small group storytelling activities as part of an event for their Cultural Commons initiative. Megan easefully taught us thoughtful ways to establish organic, authentic friendships and deepen ones that already exist. Our staff were empowered to ask thoughtful questions and the training led to fruitful conversations at the event. Megan’s teaching style and thorough prep were excellent and we would love to work with Ex Fabula again. We worked with Health Promoters/ Promotores de Salud from Latino, Native, African and African American communities to develop personal stories to share at United Voices’ Minority Health Month event, which brought together Promoters from around the city for a day of learning and community building. 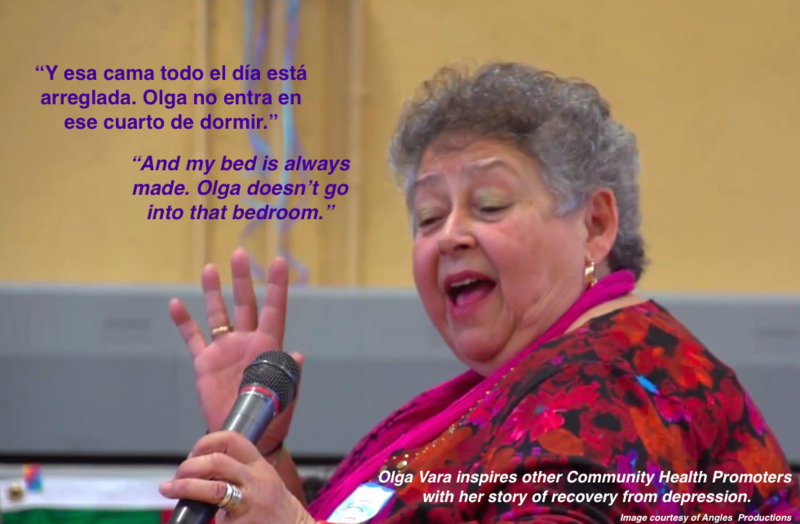 Each storyteller revealed the often personal reasons for his or her passion and activism around community health. You can see brief clips from the stories as part of this video that United Voices made. As part of the Harry and Rose Samson Jewish Community Center’s Day of Learning in February 2014, Ex Fabula presented two storytelling workshops followed by a StorySlam on the day’s theme, Home. 10 people took the stage to share stories and the audience of 40 people submitted UltraShorts, revealing that “home” may be found in Milwaukee, across the globe, or even occasionally in an airport restaurant. 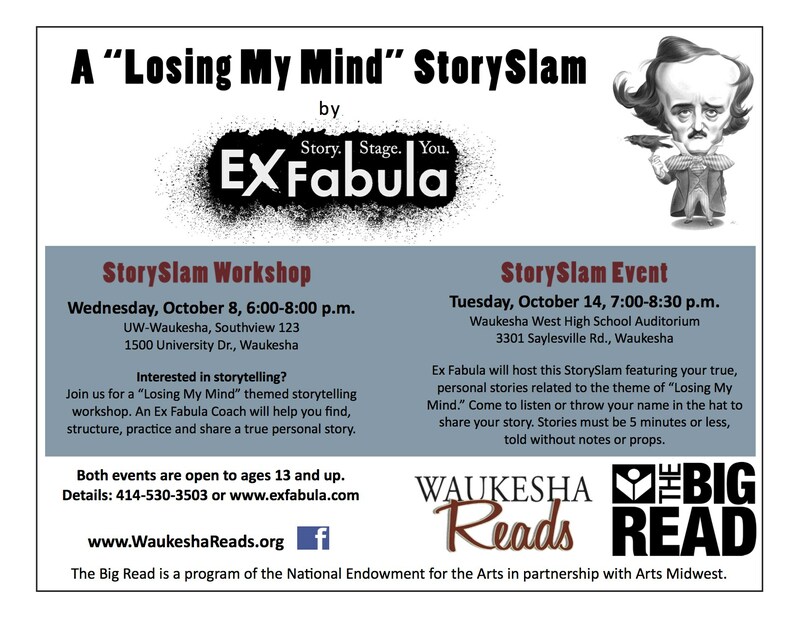 In October 2014, Ex Fabula conducted two high school workshops, one public workshop and a StorySlam as part of Waukesha Reads. This series of free events helped participants to develop and share stories on the theme of “Losing My Mind” which was chosen to coordinate with the Edgar Allen Poe stories and poems that the community was reading and discussing. At the noncompetitive StorySlam, the audience heard stories about life experiences that varied from pregnancy to scary sounds to clinical depression. 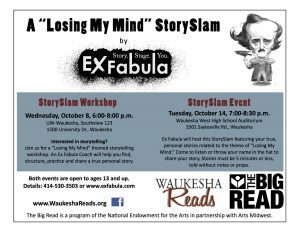 Ex Fabula’s residency at the John Michael Kohler Art Center in Sheboygan included workshops with students, seniors, the carpentry union, the Salvation Army and several StorySlams including one in Spanish. The series cultiminated with 3 performances of the Sheboygan Spectacular, which featured a juried program of stories from community participants and live music. Video of a bilingual story shared at the Sheboygan Spectacular. We’ve assisted hundreds of nonprofit employees and service recipients to tell Stories of Impact that demonstrate the important work being done in nonprofit organizations. After the partnership, the nonprofits can continue to leverage the stories – in text, audio or video formats – on their website and in grants, solicitations, and volunteer recruitment materials. John Krall takes the stage. Photo by Art Montes. 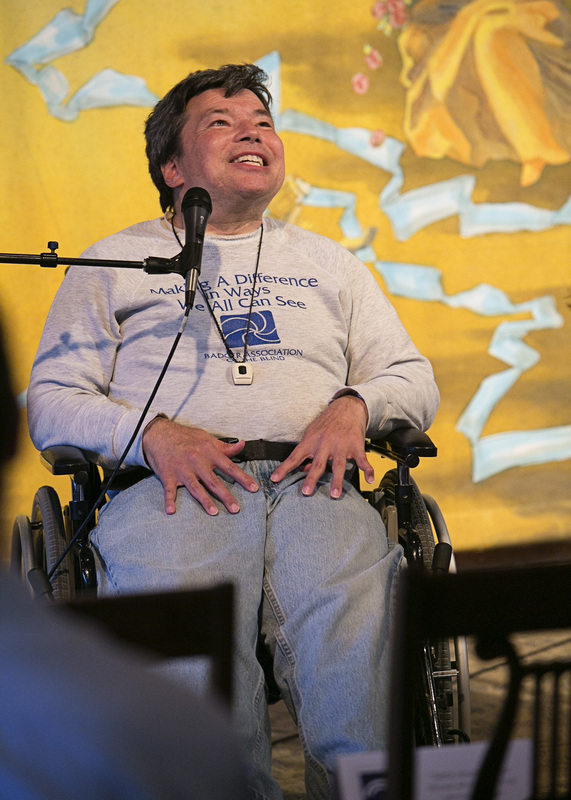 Broadscope Disability Services wanted to do something special to celebrate the 25th anniversary of the ADA, so we created a special, public StorySlam with the theme of “Easy Access”. Broadscope staff selected 3 of their clients with disabilities to share stories at the event; we provided one-on-one coaching to help those individuals prepare and even invented a new format so that a non-verbal man could share his story. Those storytellers told the first stories at the event; the second half of the event featured stories from people in the audience who put their names in the hat. As part of a project with Great Lakes Hemophilia Foundation, we coached people with bleeding disorders, who then shared touching stories about many ways that GLHF had empowered them and helped them to live healthy, productive lives. Ex Fabula was an integral part of our 40th Anniversary event. Through her coaching, Megan connected the dots in our speakers’ narratives, adding a chronological flow to their speech and refining raw experiences into evocative stories. She facilitated the peer feedback process, creating support and solidarity. With Megan’s guidance and prep, our speakers were confident and focused on the heart of their story. We will definitely use Ex Fabula again! —Danielle Leitner Baxter, Great Lakes Hemophilia Foundation. Legal Action of Wisconsin‘s Equal Justice 45 event used storytelling to help highlight the humanity and resilience of the people they serve. 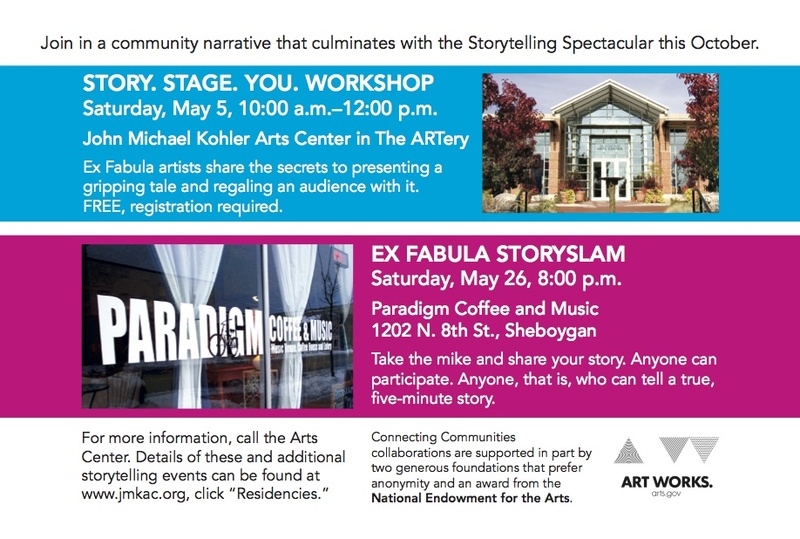 Ex Fabula coordinated coaching and emceed a 40 minute program of stories. We hired Ex Fabula to teach storytelling to some of the world’s most notable skeptics: Lawyers. Ex Fabula helped our lawyers break-through the lawyer facade and tell the important stories of our clients, low-income people seeking justice.